INBIS ( Formally Ricardo-Hitec ), Bamber Bridge, Allen Bradley coding for production line for the Rotary Switches ( in steering wheels of Rover Cars ) for Lucas Automotive Parts using SLC504's. This was a contract position where I was pulled in to get them out of the mire. They had a 14 station production line for the assembly of the rotary switches which go into steering wheels of cars. The production line also consisted of a number of operator stations where the components were placed onto the jigs prior to the automatic assembly and subsequent testing stations for the rotary switches. At every qualifying stage of the transit of these rotary switches around the production line, the data ( the welding information, the electrical testing and insulation testing results ) were pumped back to the central logging machine running VB. As the control engineer I was involved in packaging this information to the central logging machine and controlling the individual station operations - including the 'disaster recovery' senario - where the pallet and contents have to be extracted from the station and the station has to be re-zeroed ready to receive the next pallet. The 'disaster recovery' control and the human interface control are always the most difficult aspects of the control system - and have to be considered at the earliest most stages of the design. Also AB coding for Durability Test Rig for Lucas Automotive Parts using ( using SLC503 ). This time I do have a photograph. 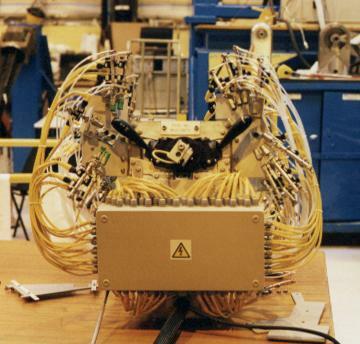 This rig although it is difficult to see from this photograph, is designed to test the durability of four steering wheel assemblies simultaneously ( hence the number of cables coming from the control box ). I adopted an approach that allowed the very easy modification of the code to facilitate the introduction of other requirements / switch assemblies should they be required. The test was performed on a cyclic basis, simulating the rotation of the wheel and operating all the switches at different positions of the wheel. The code was structured such that there were two main arrays, an input array and an output array - once the inputs were met the outputs were driven. They was also a third array which was an input mask and a fourth which was a dwell time array. The results were being monitored by a PC running VB which just observed ( and logged ) the results. ( For those of you who are thinking that the majority of the assembly is unaffected by the rotation of the central housing - full marks - the rotation of the wheel was only testing the horn, airbag release and cruise control buttons that are situated on the rotating section of the steering wheel - this rig tested both the static and the moving parts of the switch assembly ). Martin Singh and all the others.